Don't tread on me > Don't tread on anyone > No one tread on anyone > Don't archate. Probably because they don't want to understand, because it would show they need to change. To make themselves a better person. Again, it's a suggestion. A promise from me to you. I think you'd be better off to adopt this philosophy, too, but I don't expect you to. Just know that it's how I will relate to you and others, including how I might react if you do choose to archate. 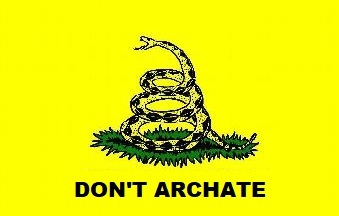 For your own sake, and for the sake of humanity, don't archate.